Yet, it must be added, Srila Prabhupada was also a unique person. To say that the teachings of the ancient ones come to us through a series of teachers does not mean that the teachers themselves are interchange able. If they were so faceless, there would be little point in writing a biography of any of them. But this life of Srila Prabhupada is pointed proof that one can be a transmitter of truth and still be a vital and singular person, even—in a sense I now feel safe to use—in some ways “original.” Srila Prabhupada lived during a particularly critical period in Indian history, that of British colonial rule and its aftermath. He worked with and among dozens of people who befriended, opposed, supported, or ignored him. He initiated Back to Godhead magazine. At what almost anyone would consider a very advanced age, when most people would be resting on their laurels, he harkened to the mandate of his own spiritual teacher and set out on the difficult and demanding voyage to America. Srila Prabhupada is, of course, only one of thousands of teachers. But in another sense, he is one in a thousand, maybe one in a million. As a Christian, it is very important and impressive to me that Srila Prabhupada took it upon himself to bring the teaching he so well represents to America. This sentence I am sure requires some explanation. First of all, as a Christian I come from a tradition in which God’s sending of someone to bring a vital message to those who desperately need it is held in very high esteem. Throughout the Hebrew scriptures, Yahweh sends prophets to remind the people how far they have strayed from His will, to expose the way they have misused the poor and failed to defend the widow and the fatherless. In the New Testament, Jesus sends forth his disciples two by two, asking them to take along only the scantiest clothing and equipment, telling them to bear the message of peace and salvation to the uttermost parts of the earth. God Himself is depicted as sending His only son into the world on a mission that would ultimately cost him his life. Christians are taught to respect and admire those who are willing to pay the heavy price of leaving comfort and security behind to go somewhere else to carry a message of liberation. Today, however, many Christians have become comfortable and complacent, not only unwilling themselves to engage in such hardship but often unable even to understand or appreciate those who do. It is a great loss. Even though some people claim it is a good thing that many Christians are no longer as interested in carrying their message to other parts of the world, that they have become less presumptuous or arrogant, I personally believe it has more to do with sloth and the satiety of consumer society than with humility. I have little patience with zealous proselytizing no matter who inflicts it on whom. I do believe, however, that any spiritual teaching worth following is also worth sharing. When I visited India, living in fact in the very place where Srila Prabhupada’s tradition is centered, Vrindavana, I was thankfully received by everyone there, including the sages and holy men, and was asked to share my tradition with them. I spoke to them as a Christian about what Jesus Christ means to me and about what his teaching has to offer to the world. They listened attentively and gratefully. Their only complaint, as I recall, was that I had not spoken long enough! Indians, unlike Americans, seem in no hurry to rush off to something else if there is a serious spiritual discussion to be followed. Given the fact that I was so well received in Srila Prabhupada’s own land, I am sorry that he and his students still often find it so difficult to be heard or to be taken seriously here in America. I am grateful for this book for two additional reasons that its writer could not have known. First, the author uses, among other methods, the growingly important method we in the West call “oral history.” He incorporates the fruits of many interviews with the people who knew Srila Prabhupada or who encountered him, who contribute some little bit of information, however tiny or fleeting, to make up the whole picture. In a few years all these people will have passed on. Those sources will be lost, at least to our mortal ears, forever. It is extremely important that the writer used this method and used it so very skillfully. I hope others will use it as effectively. The movement he founded spread rapidly around the world, attracting the attention of leading scholars and religionists. 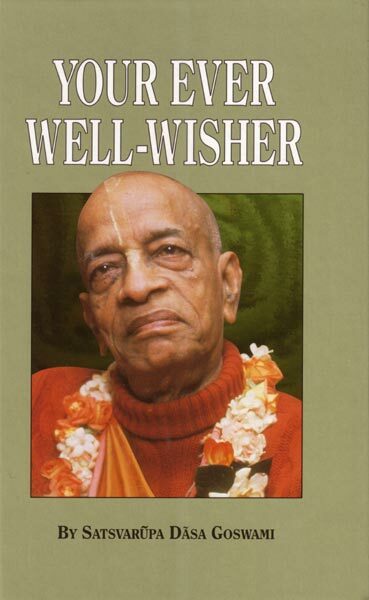 Condensed version of the biography of Srila Prabhupada, Srila Prabhupada-lilamrta. The movement he started is now known to millions around the world, yet he himself remained in the background, without personal ambition. This is the fascinating biography of an extraordinary saint, scholar and religious leader: A. C. Bhaktivedanta Swami Prabhupada. "The life of Srila Prabhupada is pointed proof that one can be a transmitter of truth and still be a vital and singular person.…Srila Prabhupada is one in a thousand, maybe one in a million." —Harvey Cox, Professor of Divinity, Harvard University. The riveting story of Srila Prabhupada's life will make you wonder how the world has largely missed this saint who recently walked among us. As a sociological, philosophical, or religious study, Srila Prabhupada's life story stands tall as a unique contribution to millions of individuals and to the world. If you read nothing else about bhakti-yoga, read this biography—the life of one soul steeped in pure love for God. "Who is Srila Prabhupada?" people often ask, and it is always a hard question to answer. For Srila Prabhupada always eclipsed conventional designations. At various times people have called him a scholar, a philosopher, a cultural ambassador, a prolific author, a religious leader, a spiritual teacher, a social critic, and a holy man. In truth, he was all these things and more. Certainly no one could ever have confused him with the modern entrepreneurial "gurus" who come to the West with slickly packaged, watered-down versions of Eastern spirituality (to satisfy our urge for instant well-being and exploit our well-documented spiritual naivete.) Srila Prabhupada was, rather, a true holy man (sadhu) of deep intellectual and spiritual sensitivity—he had deep concern and compassion for a society which, to such a large degree, lacks real spiritual dimension. For the enlightenment of human society, Srila Prabhupada produced some eighty volumes of translations and summary studies of India's great spiritual classics, and his work has seen print both in English and in many foreign languages.